Romania has a large agricultural industry. With 30% of the country’s land areas covered by permanent pasture and a favourable geographic position, it is one of Europe’s leading exporter of live animals, especially cattle breeds and sheep breeds. The most popular breed of cattle in Romania is Baltata Romaneasca, also known as Romanian Simmental or Romanian Spotted Cattle. Other cattle breeds are also present in Romania: Crossbreed Blanc Blue Belgium, Crossbreed Charolais, Crossbreed Limousin, Crossbreed Braunvieh, Crossbreed Angus and others. 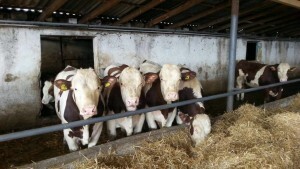 the Simmental bulls – imported from countries like Switzerland, Austria, Germany, Czech Republic and Slovakia. with Grey Romanian Cattle – a native breed originates from the wild ancestor Bos Taurus primigenius, which disappeared in the XVIth century. This breed was raised in historical provinces such as Banat, Transylvania and Bucovina. Nowadays, it is found in many areas and is the most frequently met breed in Romania because it adapts very well to climate conditions. The Romanian Simmental was established as a breed in 1959 and is related to the following breeds: Simmental, Czech and Slovakian Spotted Cattle, Hungarian Spotted Cattle, Sychev, Fleckvieh and Montbéliarde. Because it slightly adapts to high temperatures, they have no problem being grown in countries such as Egypt, Libya, Iraq and others. Romanian Simmental is a multipurpose breed. In present, it is the main supplier of beef meat in Romania, with the meat productive type surpassing in importance the milk productive type. This breed has spread quickly due to its qualities, nowadays it represents 36% due to the establishment of a new breed – Black Spotted Romanian Cattle. Copyright © 1994-2018 Seradria. All rights reserved.